You’re downright saucy when it comes to stating your style, and upon sighting this fun frock, everyone around you will be in awe of your fashionista prowess! 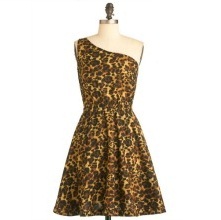 With a vibrant cocoa-and-tan Leopard print, one-shoulder fit-and-flare silhouette, and a cotton composition with elasticized waist made for comfort, this glorious frock looks stunning with finely textured tights and platform Oxfords. Slip into this darling dress for a dose of extra confidence before proclaiming your opinions with pride! Fabric does not provide stretch. Elasticized waist provides approximately 3.5 inches of stretch. Hand or machine wash cold. Do not bleach. Tumble dry low.